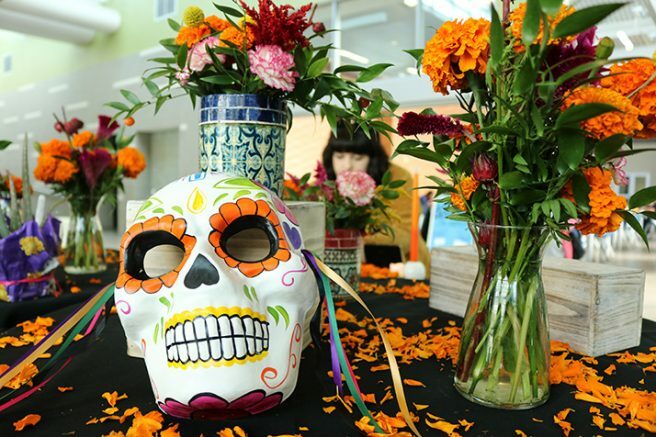 The American River College horticulture department celebrated Dia De Los Muertos on Nov. 1, 2018 with a themed flower sale in the Student Center. On Thursday, Nov. 1, the horticulture department incorporated a Dia De Los Muertos (Day of the Dead) theme into its weekly flower sale in the Student Center. Dia De Los Muertos is a holiday that originated in Mexico; it celebrates deceased loved ones through different traditions, festivities and altars. The two days of celebration are also most notably accompanied with different masks makeup, and costumes worn by those celebrating. Christen Hollingesworth is a horticulture major and, ran the sale that happens every Thursday. Hollingesworth said she always tries to include holidays in her approach to the design and presentation of the flowers, and was happy to embrace this one. During the event, bright marigolds sat on top of black table clothes and served as the main flower, placed on two tables and an altar, at the forefront of the colorful event. While Hollingesworth’s conception had many beautiful aspects to it, she said the altar was her favorite piece in the set up. “I think it’s beautiful, I’m really excited that I did these garlands, and the candles add a lot, I think it’s just the colors…I definitely have to say this focal point of everything,” Hollingesworth said. Rosie Hernandez, a horticulture major, lent a helping hand and gave insight on the significance of the altar. Marigolds are another essential piece to celebrating Dia De Los Muertos. While the sale was comprised of other flowers as well, such as carnations and celosia, marigolds were the main focus. The Dia De Los Muertos-themed flower sale is one of many sales to come. The money earned from the sales makes its way back to the Horticulture department and helps funds their program. Hollingesworth and the Horticulture program hold weekly sales to display their new arrangements every Thursday, 10:30 a.m. to 12:30 p.m. in the Student Center. 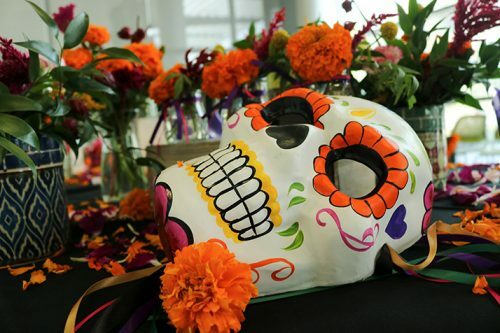 Be the first to comment on "Dia De Los Muertos bloomed for Horticulture’s Sale"